Bunny basket eggs are an old time favorite Easter Candy. A firm marshmallow center with a hard candy coating in a mixture of pastel colors. The name of these candies have been changed to bunny hunt eggs. Many of our customers ask what is the difference between the two. Basically the only difference is now that come wrapped. These are one of those candies you either like or don't. From our experience it seems like these are favored more by adults then by kids. Although it's candy so kids usually will eat them. I am extremely glad that they have now decided to wrap the bunny basket eggs. For some reason the Easter bunny always had to put these in my Easter basket. I was always picking the grass off of them before I could eat them. 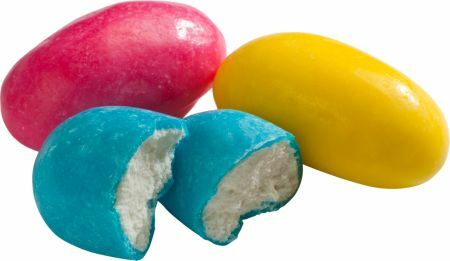 If you took a bite out of one you better not decide to put in back in your Easter basket, because if you did, you were eating grass. Believe me you I know this from experience. Here is a little titbit of information you may or may not have known. Bunny basket eggs have been around since the early 1900's. Of course I am sure they have changed over the years. But way back then before the plastic eggs came out, these candies were what was used for Easter egg hunts. The candy eggs would be hidden for the kiddies to find. I bet the kids wished they were wrapped then.